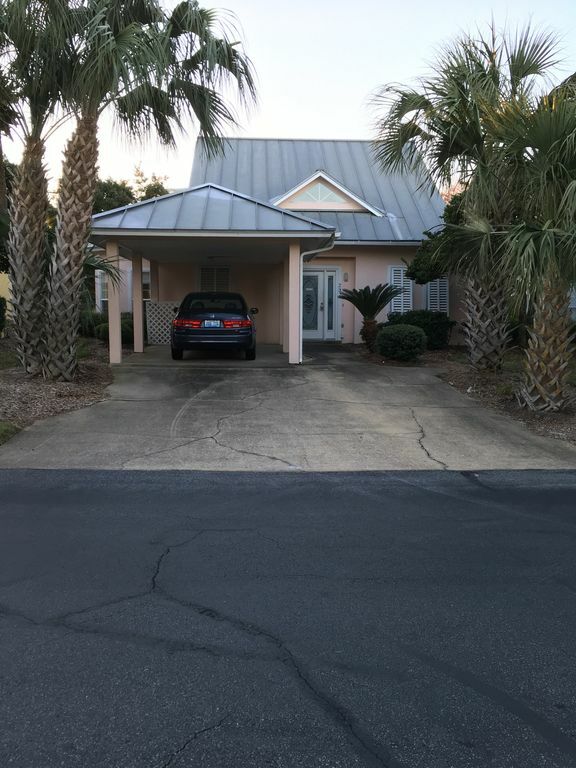 Our two-story home is located in the family-oriented Mainsail Beach Resort complex. We are just yards from the beach without the normal hassles of high rise elevators, but with all the amenities of a complex (tennis courts, two full-size pools (one heated), two kiddie pools, hot tub, video game room, exercise room, shuffleboard and basketball court, as well as seasonal beach service. You drive your car right up to the front door under cover of a carport. Your children can play in the yard or swim in the heated pool just outside our back patio door. Mainsail is a 15-acre Gulfside family resort located across the street from the Silver Sands Outlet Mall. The resort is a gated community with 24 hour courtesy patrol. Our cottage is convenient to great golf courses, deep sea fishing, biking, shopping, great food, and all kinds of water activities. * Living room with high definition flat screen TV and DVD. * Dining room seats six with additional seating for three at the kitchen bar. * Kitchen is fully-equipped with electric stove, microwave, refrigerator with ice maker, dishwasher, and coffeemaker. * Laundry room - washer and dryer in unit. * Master bedroom suite with king-size bed, TV, and full bath with double sinks and large wall in shower. * Patio with table and six chairs opening to back yard and pool area. * Bedroom with two twin beds. * Bedroom with queen-size bed, TV. * Balcony overlooking back yard and heated pool. Enjoy cooking in our fully-equipped kitchen or grill out using the gas grills provided in the pool area. Our beautifully decorated home is our 'home away from home.' For those times we can't be there, we enjoy renting it to families who agree to treat it as they would their own home. * This is a Non-Smoking unit. * Mainsail does NOT allow pets and requires at least one person in your party to be 25 years old. Tony started going to Destin with friends every Spring Break in 1989. We started going a couple years later when Tricia was ready for a Spring Break in Destin. We loved Destin so much, we went back for vacation every summer. We stayed at Beach House, SeaScape, Surfside, and Edgewater, before staying in a Mainsail townhouse. Mainsail was by far our favorite resort community. Everyone was so friendly and the resort is very family oriented. One of the Mainsail cottages was for sale and we went to see it. We decided since we loved Destin so much we might as well buy a place and rent it out until we are ready to retire. It was a great decision! We love our home and we have been lucky enough to find wonderful families to rent our home and take great care of it for us. What we love most about our Mainsail cottage is we have a home to ourselves with a carport and yard. We don't have to find a cart and wait for an elevator to carry in our luggage or groceries. With a home, we have enough room for everyone to enjoy themselves without feeling crowded. I love the large kitchen. Most condos have such small kitchens I hate to cook in them. Very clean and comfortable cottage. Master bathroom and shower is wonderful. Kitchen well stocked. Felt very much at home. Nice resort, warm heated pool. Owners very easy to work with. Renting again next year. Thank you for taking the time to write a review. We always try to keep our home nice and make it feel like home for our guests. I am glad you will be returning next year. Thank you so much for taking the time to write a review. I am happy you enjoyed your stay and continue to come back to our home in Destin. We love renting to great families like yours who take such good care of our home. The house was fantastic! So nice, updated! The house was fantastic! It was so nice, spacious and beautifully decorated. All amenities were provided. So comfortable. I am so very sorry that the storm cut our stay short, but hope to take advantage of it again in the near future. We did a short girls trip 8/9/18-8/12/18 and the house was perfect. The pool is right behind the house and the beach is just a short 1-2 min walk from the back door. The house was clean and cozy. We will definitely be back. Thank you for the great review! I hope you will come back again soon. Very nice place and very convenient, the best place we have stayed in all the years we have visited the Destin area. Thank you for your review. It is always a pleasure to rent our home to a family who takes such good care of our home. We try to keep our home in great shape and well equipped for our guests to enjoy. I am glad you found our house to be the best place you have stayed in Destin. This cottage was great, we really enjoyed it. It had everything we needed. It is the best place we have rented in all the years we have visited Destin. We would definitely rent again in the future! One-time cleaning fee is included in rent. One daily beach set-up (umbrella and two chairs is also included in rental fee March 1- November 1. A $500 payment towards rent is due at time of reservation. Balance of rent and tax is not due until 15 days before your arrival. If paying by check, check should be made payable to Arauz Properties LLC and sent to 914 Cannons Lane Louisville, KY 40207. We hate to have vacancies. Please call Pat at 502-802-6746 to negotiate a rate.